We don’t cover much automotive news here at Common Tread, but GMC’s new CarbonPro option for the Sierra Denali 1500 and the Sierra AT4 1500 crossed my desk because the CarbonPro bed was actually designed with motorcycles in mind. GMC, thanks for thinking of us. Are these features we can actually use? 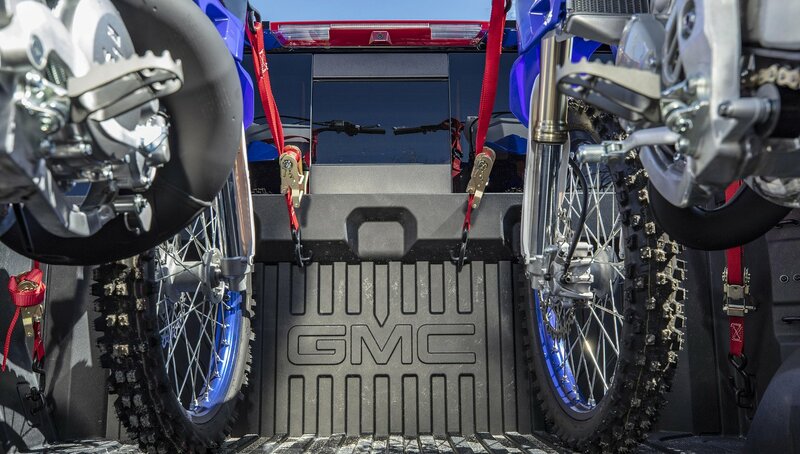 Most motorcyclists are already aware of the benefits of carbon fiber, but GMC’s bringing it to their truck beds while keeping powersports enthusiasts in mind. The CarbonPro bed is made from Carbon-Fiber Reinforced Plastic (CFRP), not unlike the carbon shell you might find on your exhaust, helmet, or knuckle protectors. CFRP sheds weight without compromising durability. GMC photo. The basic benefits, strength and light weight, are just as desirable in the automotive world: a CarbonPro bed saves around 60 pounds over a steel equivalent. GMC also found their carbon bed to be exceedingly durable in tests. They even tried loading a snowmobile with studded tracks into the bed and revving it. The carbon only showed minor scratches. Ice racers, rejoice! Ready to receive a tire. GMC photo. Look to the front of the bed, and you’ll spot three notches in the CFRP. Those are intended to hold motorcycle wheels. Capacity should be about two skinny ones, like dirt bikes, or one big ‘un. Then there’s a range of anchor points for straps, which is ideal for hauling bikes. The mini-gate takes over when the main gate has to be open. GMC photo. 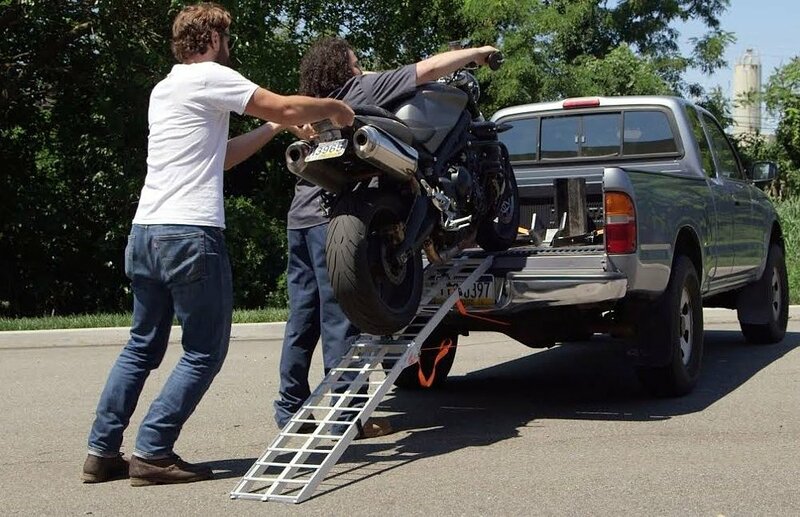 Loading heavy motorcycles into the bed was actually part of the testing process for the new MultiPro tailgate, says Derek Patterson, an engineer on the MultiPro design team. Like other truck manufacturers, GMC is finding ways to get extra functions out of a tailgate. Different configurations of the MultiPro gate can provide a perch for loading ramps, a step up into the bed, or a flip-up stopper to retain cargo with the gate down. It's a close fit, but it works. Photo by Jeff Kiniery. GMC isn't the first company to think of bikes when designing pickups. Honda's Ridgeline could be optioned with OEM motorcycle wheel chocks, which Zillan Jeff uses to haul his dirt machines. And before that, Toyota's promotional Yamahauler longbeds screamed "I'm for moving motorcycles!" A variety of mounting options means bikes can be better secured in transit. GMC photo. GMC, I appreciate the gesture, but let’s see these features on base models and more everyman vehicles like the Canyon. Moto wheel cutouts can be molded into your plastic beds, too. If reaching powersports enthusiasts is on the agenda, give riders the tools they need to safely transport motorcycles, no matter the trim level. More importantly, I’d invite any auto manufacturer interested in reaching motorcyclists to come visit RevZilla HQ for a little market research. Our parking lot is so packed with Tacomas, Rangers, and small Japanese trucks, it’s a running joke at the office. Zillans really love regular cab pickups with the longest beds possible, and nothing crazy tall, either. Even bar-to-bar, two dirtbikes fit. GMC photo. Regardless of your take on trucks like the GMC Sierra, it’s always nice to see other industries considering the needs of motorcyclists who need to move motorcycles without riding them, whether transporting dirt bikes to the trail, moving a disabled bike to the shop or whatever. Prices for the CarbonPro option haven’t been revealed yet, and production doesn’t start until June. Hold on to your wallets.